In a follow up to my recent breakfasty/brunchy post about Sweet Potato and Butternut Squash Hash, I’m sharing with you my favorite way to make eggs. I love over-easy eggs because the white is completely cooked but the yellow, bright yolk is ooey gooey runny. But cooking the eggs in left over bacon grease takes them out of this freaking world. Needless to say that I don’t do this often- maybe once every 6 months. Bacon is one of those simple things that we treat at a luxury. I much prefer to buy a good quality bacon that is thick cut and pretty lean. 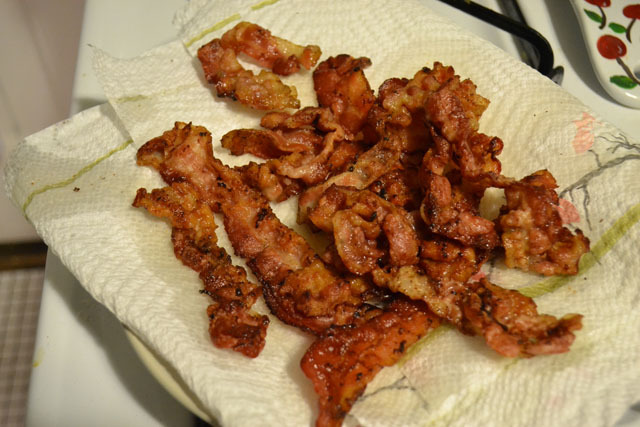 (In the case with this photographed bacon, it was leftover from Thanksgiving. We cover our turkey in bacon so the highest quality would be wasted in that case.) Since it can easily be $9-10 a pound I tended to save it for leisurely weekends in when we can really enjoy the paper. Also, when Price and I make bacon we make a lot of it all at once so the leftovers can be used in BLT’s, added to sandwiches, and sprinkled over salads… makes for a good week! Cooking eggs this way makes for a very airy egg that some salty, smoky favor. 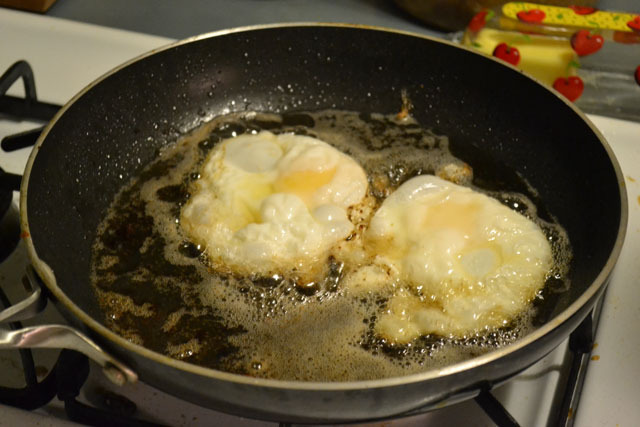 Since the eggs are frying they are some what suspended in the grease, the egg has light, crunchy pockets. I really enjoy the texture of the egg this way, especially the crunchy edges. 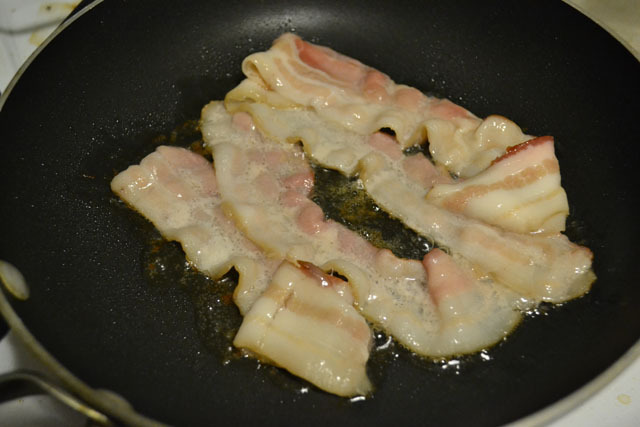 Fry bacon in a non stick pan. Save enough bacon grease to generously coat the bottom of the pan. 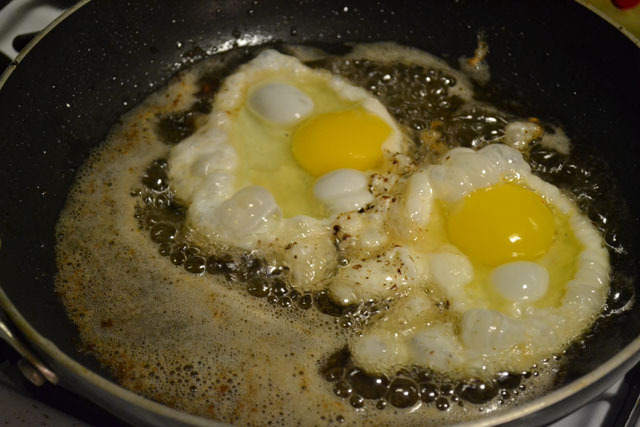 Placing no more than 2 eggs in your pan at the time, fry eggs on medium/medium-low heat. 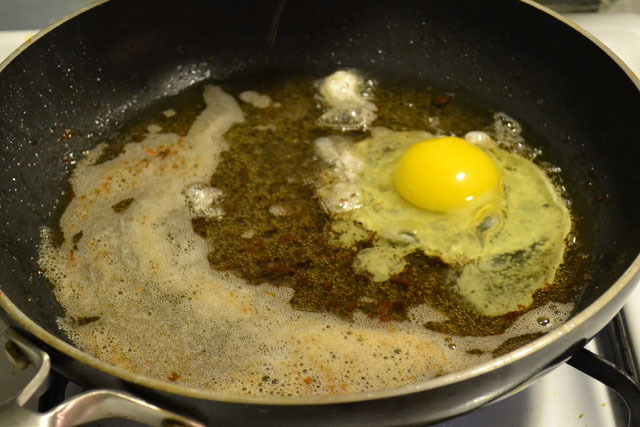 After a minute of cooking cover with a lid to the top of the egg will cook. 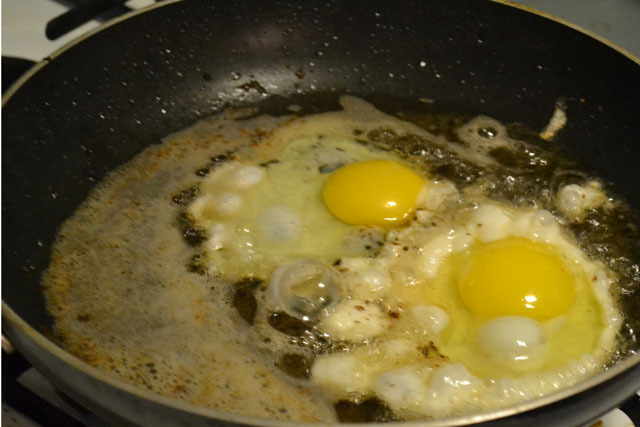 Eggs are complete when the top is cooked, while the egg yolk is still light, and therefore runny. While still really hot, sprinkle salt and pepper over the eggs. 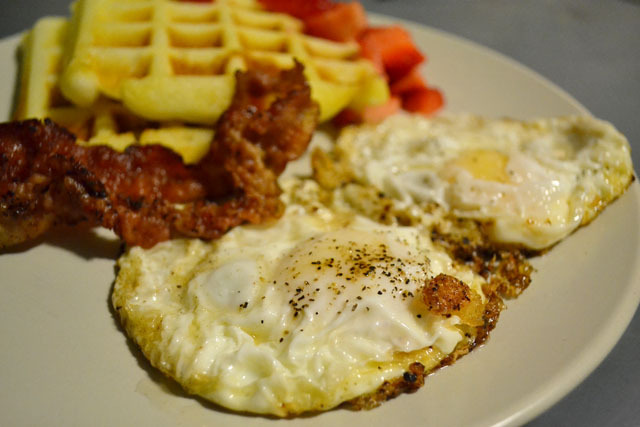 Serve with bacon and your favorite breakfast sides. That’s how my grandma always made eggs! Or if she was out of bacon, she’d just melt shortening in the pan. I’ve never done it like that – I need to try it. Josh is obsessed w/cooking his eggs this way only he cooks them with butter – probably mostly because we rarely cook bacon. I’ve never had real *good* bacon. Someday I want to though! I always cheap out and get stuff at the store. Can’t be beaten, eggs & good quality thick-cut rashers of bacon, cooked in bacon fat. A true English breakfast, followed with hot buttered toast & thick-cut home-made marmalade, that’s if there’s any room left, after a great breakfast!